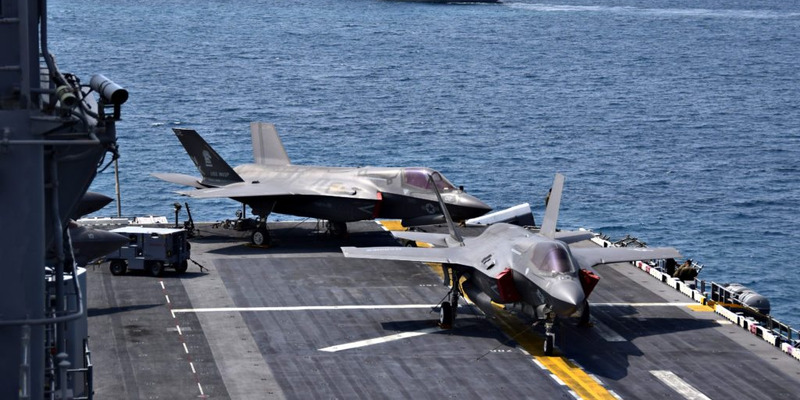 US NavyThe F-35Bs lined up for takeoff on USS Wasp (LHD 1) are potent. Imagine if Wasp was hauling a full squadron of them. The US and South Korea’s upcoming military drills will reportedly feature the USS Wasp, the US’s first-ever aircraft carrier to carry F-35 stealth jets. The jets mark a huge upgrade in US military sea power and capability, and something North Korea just isn’t prepared to deal with. North Korea has made strides both towards nuclear weapons and diplomacy in the year since the last round of major military drills, but the US will remind Kim Jong Un that it still means business with the USS Wasp. The US’s long-awaited F-35 stealth jet will feature in military drills with South Korea aboard the USS Wasp, a US Navy amphibious assault ship that became the first-ever ship deployed with combat-ready stealth jets onboard, CNN reports. The Wasp, and the squadron of US Marine Corps F-35 pilots onboard, will take part in the drills which kick off on April 1, even as the US and South Korea explore an unprecedented openness to dialogue from North Korean leader Kim Jong Un. Though South Korean President Moon Jae In and President Donald Trump have both agreed to meet with Kim, they remain committed to keeping up the “maximum pressure” strategy that both sides say has led to North Korea’s new willingness to talk. As part of the pressure strategy, the US has pushed tougher-than-ever sanctions on North Korea, and leaned harder than ever on the prospect of using military force to denuclearize the peninsula. In April 2017, the US demonstrated that pressure with three aircraft carriers off North Korea’s coast. In 2018, the US has a revolutionary new capability in a smaller carrier with F-35s, stealth aircraft that North Korea can’t hope to spot or defend against. In 2017, North Korea responded to US and South Korean military drills with angry statements and missile tests, but this time around, Pyongyang has said it will suspend its missile testing. Since last year’s US-South Korea drills, North Korea has demonstrated both the ability to hit the US with a nuclear weapon, and a newfound willingness to talk about denuclearization. The US in that time has stepped up military pressure while imposing crippling sanctions down to the level of individual businessmen and ships. As this year’s annual military drills come around, there’s a completely different mood as hope of negotiations lie on the corner, but the inclusion of the USS Wasp stacked with F-35s sends the message that it’s still not safe.